Printed from http://www.bodytalksystem.com//learn/news/article.cfm?id=873 on Apr 22, 2019. Spot the difference! Below, you will see two images of a 'similar thing'. What's the difference to you? All of these images look similar don't they, or do they? Experience them individually, and you will find them to be a vastly different from one another. "I'm going to San Francisco this weekend, do you want to come? ", "No thanks, I've already been to a city". "I read this awesome book last week, you can borrow it if you like", "No thanks I've already read a book". "I have a spare ticket to a concert on Friday night, want to come with me? ", "No, I've seen a concert before"
Yet I have heard this, "Access for Animals is on next month, come along! ", "No it's alright, I've already done the Access for people one, and they are pretty much the same"
As the images illustrate, no two things are ever the same. No two will feel the same, look the same, sound the same, smell the same or taste the same. To experience each one is unique, and to experience the 'same' thing again is going to be different from the first time. 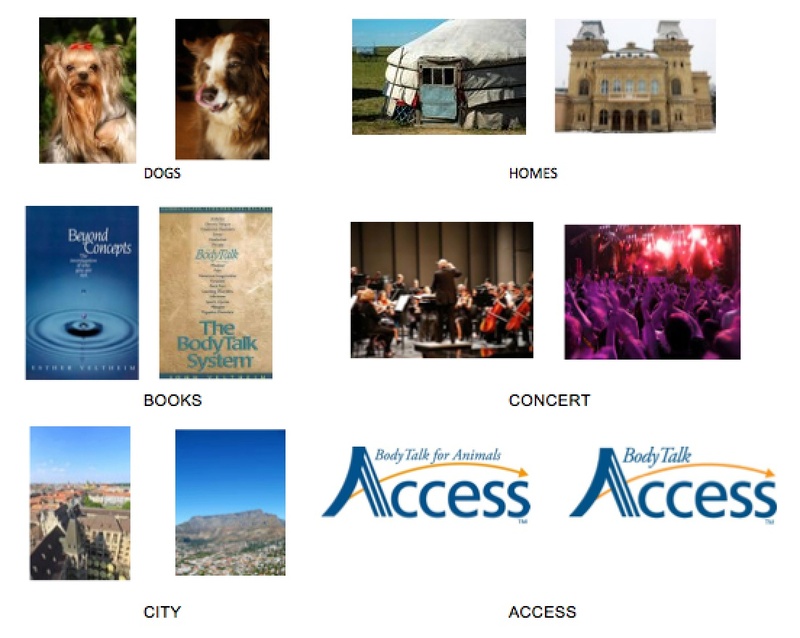 Allow me to guide you on what some of those different aspects might be when you attend BodyTalk Access for Animals. Firstly, every Instructor has their own attractor fields and so attracts different people, animals and experiences to their classes. They have their own teaching styles, own vibrancy and so your experience will be different in each class. Many BodyTalkers have taken classes and then registered for them again with a different instructor simply because they know the experience will be different. In Access for Animals you will journey with your facilitator and the animals, exploring concepts surrounding the birth and growth of BTAA. There are some differences in the Access techniques for Animals and we look at what they are and why they are unique for animals. Along with discussing the concept of the Innate wisdom we also look at the effect our lives and belief systems as humans can and do have on domesticated animals (including zoo's, sanctuary's etc.) in comparison to animals in their natural habitat and environment. Many of their issues are in fact a mirror for what we are experiencing so this class has the potential to catapult you into your own heart based awareness, initiating the process of becoming an observer to the effect your belief systems and lifestyle choices have on your animal friends. Some people think that the Animal Access program is only of benefit for addressing basic health challenges and discount the enormous influence of this class on the emotional and behavioral health of not only the animal but also their family. We delve into the tapping process and the huge importance of the breath cycle, why we do that and what seems to be happening when we facilitate it. The importance of creating a safe space for the animal and yourself when doing the balancing techniques should not be undervalued and is something we can all be reminded of. You will learn how animals 'shift' their emotions with simple physical releases which you will have the opportunity to observe whilst holding the space for that process to occur. We walk through the concepts of calming and warning signals; the role movement plays in processing and the undeniable importance of being the observer who holds a heart based connection. BodyTalk Access for Animals has had a recent change of face which sees many facilitators offering it as a full two day class. This allows for a deeper exploration of the techniques and more time to observe and experience releases during the balancing techniques for both animals and HUMANS! Another bonus is that your instructor gains more valuable time to facilitate BodyTalk sessions for students and their animals. This class has the potential to be a profound experience and if you are new to BodyTalk it could be the perfect catalyst to launch you on your journey into The BodyTalk System and the life science classes. I'm a huge advocate for both Access programs but it is time to get clearer about the significant difference between them even though they might look the same. Can you spot the difference now?